MDL won a case for $950,000 against a wood chipper manufacturer for a defective safety mechanism resulting in loss of a foot to a landscape employee in 1994 who used his foot to kick in branches into the mouth of the chipping blades. MDL was able to prove that the manufacturer knew of this dangerous defect, yet they never issued a product recall. One of the most common types of workplace injuries occurs when machine operators suffer amputations, lacerations, de-gloving, or other serious injuries from the operation of machinery that is not properly guarded. The powerful parts inside heavy machinery can cause severe workplace injuries, including amputations, burns, crushed fingers, and blindness. Functional machine guards are extremely important when it comes to protecting workers from preventable injuries and ensuring a safe workplace for all. 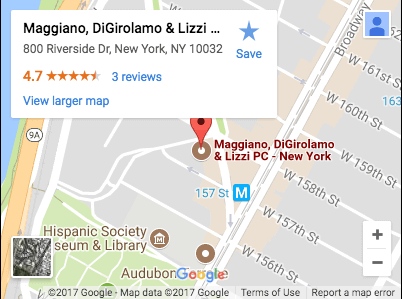 Maggiano, DiGirolamo & Lizzi are proud to represent the injured throughout New Jersey and New York. Our personal injury attorneys have more than 80 years’ worth of combined trial experience, and we have the resources and skills to fight for you. If you or a loved one has suffered an injury due to faulty machine guarding, call (201) 585-9111 or contact Maggiano, DiGirolamo & Lizzi to set up your free consultation today. Machine guards are devices put in place to protect workers from injury. Machine guarding technology has improved substantially since 1899, when the first patent for an interlocking machine guard was awarded for a power press. There are now a variety of different types of machine guarding systems, including movable interlocking guards, fixed barrier guards, two-hand tripping devices, and light curtains and sensors that detect the entry of fingers or hands in the machine. According to the Occupational Safety and Health Administration, which works to protect employees from hazards in the workplace, there are two primary methods used to safeguard machines: machine guards and safeguarding devices. A guard is a physical barrier that prevents access to a dangerous area. Safeguarding devices can either (1) prevent the worker from coming into contact with the dangerous part or (2) detect the worker’s contact with the dangerous area and stop the motion of the machine. While these safeguards have certainly come a long way in terms of improving worker safety, they are not a surefire solution for preventing workplace injuries. Every machine safeguard must be properly designed, constructed, installed, used, and maintained properly to ensure that employees are kept safe. According to data from the Occupational Safety & Health Administration, approximately 18,000 workers every year suffer amputations, lacerations, crush injuries, and abrasions while operating and maintaining machinery. Unsafe equipment also contributes to more than 800 deaths per year, showing a serious need for employers to pay careful attention to machine safety. If a machine guard system does not meet these requirements, it is not legally safe to operate. This faulty machine guard could be the result of improper maintenance, defective manufacturing, failure to meet OSHA workplace standards, or even unsafe work conditions, depending on the circumstances of the case. Many machine guarding accidents are the result of manufacturer negligence, such as the case brought by Maggiano, DiGirolamo & Lizzi on behalf of a landscaper. In this case, our attorneys won $950,000 for the client, whose foot was amputated after kicking branches into the mouth of a wood chipper. In this case, we were able to prove that the in-feed on the wood chipper was too short for safety and, instead of recalling the defective machine guards, the manufacturer instead offered a modified version for sale. In cases like these, it is important to have an experienced legal team on your side that can stand up to high-powered legal teams and corporations to prove a defective products claim. When you pursue a personal injury claim, it is critical to have resources on your side. After a serious injury, the expenses are often overwhelming; hospital bills, rehabilitation costs, days missed at work, property damage, and other expenses—on top of your day-to-day bills—can be detrimental for your finances. Dealing with these expenses on your own can be extremely stressful and impact your work, your mental health, and even your family. Our experienced trial attorneys have helped hundreds of clients navigate these expenses, deal with insurance adjusters, stand up to opposing attorneys, and fight for fair compensation. Whether your case goes to court or not, it is crucial to work with a law firm with a rock-solid reputation. Insurance companies know which attorneys have a proven track record of success and who will fight back in court for their clients. With a respected, experienced attorney working your case, the insurance company will take your claim more seriously and give you a better shot at fair compensation; plus, having a trial-proven attorney gives you more power at the negotiating table because you can threaten to take the case to court—and back it up. Our personal injury practice is headed by Michael Maggiano, a veteran trial attorney who has been listed by Super Lawyers Magazine as a New Jersey Super Lawyer since 2005. We are members of the Million Dollar Advocates Forum, which is reserved for attorneys who have won million- and multi-million-dollar verdicts and settlements, including less than 1 percent of U.S. lawyers. We have proven ourselves both in and out of court as some of the premier personal injury attorneys in the region. If you or a loved one has suffered a serious injury due to faulty machine guarding, we can help. Call (201) 585-9111 or contact Maggiano, DiGirolamo & Lizzi to schedule your free consultation today.